I met the group at MUSC this morning and went for a six mile tempo run. We had a group of about ten runners. The weather was a little warm, but not too humid. I was pretty tired from yesterday's boot camp. My legs really felt like rubber from doing so many stairs. I do not plan on doing too many of those workouts the closer I get to the October marathon. I started off with the group for a warm up mile (10:29). At the one mile mark I kicked it up for my tempo run. I did not have anyone running my pace so I ran alone from that point. I was trying to run a 7:37 pace for four miles. I hit 7:40 for the first mile and 7:50 for the second mile, but then I had to stop and stretch my legs. I was really feeling tight and I don't want to injure myself at this point. My third mile I hit 8:05 and on my forth mile I was a little slow at 8:35. I finished with a cool down mile (9:50). I was using a new route to get the full six miles in today, so I was a little over six miles. I just added that to the end of my cool down. 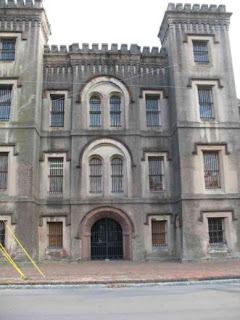 I did get to go by the old Charleston Jail - one of the best things about running is that you get to see so many cool parts of your city. My legs felt pretty tired at the end of the run. I really want to hit this pace better in the next few weeks. I can tell that this is going to help me finish the 5k better and is going to improve my time on the marathon. Using the Garmin 405 was great! I was able to see that I was slowing down and it made me work a little harder. Having the breakdown of each mile at the end of the run will help for my next run as well. I think the more I learn about setting it up prior to the run, the more it will help. Good job for seeing it through even though you had a tough time with tired legs!